Some medical procedures can't be avoided. Here's how to make them less painful for your baby—and you. When an infant needs a routine-but-painful medical procedure, such as a vaccination or blood draw, nobody's happy. "It troubles parents, it stresses health care providers, and the adults transmit their anxiety to the baby," says Neil Schechter, M.D., director of the Pain Relief Program at Connecticut Children's Medical Center in Hartford. Happily, some simple techniques can reduce stress and tension for everyone without the need for medications. First, ask to hold your infant during the procedure. "Being held calms the baby," says Schechter. Sucking has a similar effect, whether the mom breastfeeds during the needle stick or provides a bottle or pacifier. The taste of sugar water on a pacifier or from a bottle may offer the baby an extra distraction. One study found that babies who were held by a parent and given sugar water before and during an immunization cried for a median 19 seconds; those who were simply placed on the examining table for the shot cried almost three times as long. When two vaccinations are scheduled, ask that the least painful shot be given first; babies cry less when it's done in this order. When four immunizations are due, some pediatricians arrange for an assistant's help so two shots can be given simultaneously; the baby perceives only two of the four. Babies also respond better when shots are given rapidly, rather than waiting in between. 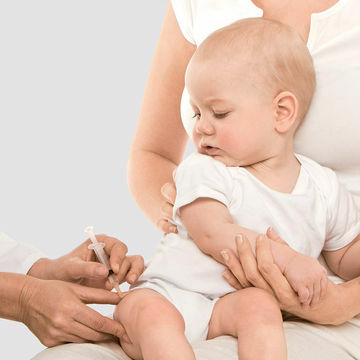 Afterward, help your baby relax by pressing on or stroking the injection site for a few minutes. Throughout the process, try to maintain an attitude of good humor instead of acting apologetic or excessively reassuring. One procedure that does require medication is circumcision. "Some studies have found that circumcising infants without local anesthesia left them with detectable changes in pain sensitivity for many months," says Schechter. "If you decide to have your baby circumcised, ask your doctor to use a local anesthetic block." Be a baby-care pro! For hands-on information, go to fitpregnancy/babycare.